Purpose & Mission: The Conductive Fiber Manufacturers Council (CFMC) is the international trade and business development resource for companies that manufacture metal clad or conductive yarns, threads, and fibers. 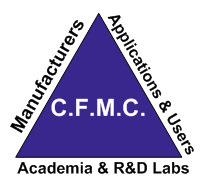 The mission of CFMC is to increase understanding and utilization of conductive fibers and fabrics through information dissemination, advocacy, research and administration of programs to the members' benefit and the advancement of their industries. History: The Council was conceived in Frankfurt Germany in 2007 as a result of fragmentation in the industry and too little information being readily available to engineers and designers about conductive yarns, threads, fibers and fabrics. After talks with industry leaders, the Council was formed in 2009. Conductive fibers and yarns have a long and glorious history. The filament in Thomas Edison's light bulb was made of carbonized sewing thread. Of the hundreds he tried, this was the first filament that met his needs for resistance and life span. Conductive fibers are a cross between the world of electric wires and the world of textiles, with attributes of each. Conductive fibers consist of a non-conductive or less conductive substrate, which is then either coated or embedded with electrically conductive elements. Substrate fibers typically include cotton, polyester, nylon, stainless steel to high performance fibers such as aramids, HDPE, PBI, PBO, PTFE, carbon nanotubes, and so on. Straddling the worlds of textiles and wires, conductive fibers are sold either by weight or length, and measured in denier and AWG. Conductive fibers and films also include metal clad fibers or films, but the universe of conductive fibers is much greater than metal cladding. Nanowires are often included in the definition of conductive fibers either because nanotechnology is used by some conductive fiber producers, or because the nanowires constitute an electrical conduction means which does not fit the conventional definition of a wire. Conductive fibers or yarns can be woven, knit, embroidered, braided, sewn etc., thus becoming conductive textiles. When woven into or sewn on to a tape, stranded or braided, or connected between two points, conductive yarns act like wires. When knit or woven in a mesh, the yarns act as an EMI shield or a ground plate. Uses for conductive fibers and textiles may include static dissipation, as a germicide, EMI (electro-magnetic interference) shielding, radio frequency antennas, signal and power transfer in low resistance versions, and as a heating element in higher resistance versions. Their benefits over solid or stranded metal wires come from conductive fibers' flexibility and ability to use in existing textile and wire machinery (weaving, sewing, braiding, etc.). (3) Academic and Research and Development members. We offer three levels of membership to accommodate these constituencies: Active, Associate, and Allied. Active membership is reserved for manufacturers of conductive yarns and fibers and conductive fabrics. Active members get access to all member benefits and sit on the Council. Associate membership consists of (non-conductive) base fiber manufacturers, companies that process conductive fibers (weavers, braiders, wire houses, etc. ), manufacturers of machines that handle conductive fibers, and distributors of products using conductive fibers. Allied membership is for non-manufacturers, people and companies that have a vested interest in the innovative conductive fiber technology industry, such as engineers, designers, consultants, schools, end-users. Mention "Conductive Fibers Cooperative Offer"
value and benefits of CFMC membership.